The Island is known for its lush forests and scenery. Gorilla technicians understand the importance of keeping the foliage out of your gutters. Regular Victoria gutter cleaning keeps organics out of your gutters. 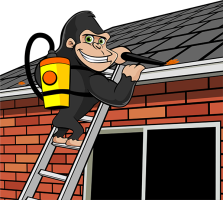 When your roof and gutters need a spring cleaning – call our Gorillas. Common tree types in Victoria include: the Anabalis and Douglas Fir. These particular trees types sport needles instead of leaves. These needles are the reason that regular maintenance is so important. Needles, dirt and even sand are impossible to remove by hand. A superficial clog is easy to remove but foundation materials are not! Without proper tools and training, your Victoria gutter cleaning can be a headache. Our Gorillas use vacuums to remove these needles, preventing them from forming a foundation for debris collection. Before your Victoria gutter cleaning is finished, all spout and gutters are tested. Photos are provided by our Gorillas before and after cleaning. These photos guarantee customer satisfaction. These photos keep our clients informed – all from the safety of the ground. Safety is our top priority, both for our staff and your property. During our Victoria Gutter Cleaning our staff use “Stand-Offs” which allow our Gorillas to reach the roof level of your home or business property without making directly contact with the gutters themselves. Your drainage system becomes damaged by resting ladders, as well as excessive weight. Gutters are dented, broken and even pulled away from your home when excessive weight is applied. Don’t take the chance of damaging gutters when our Gorillas are waiting in the wings. Making an appointment with Gorilla Property Services guarantees a job completed safely and effectively. Don’t take chances on the exterior of your property. Call today to ask our experienced staff about Victoria Gutter Cleaning.